Well! This month has been quite the adventure. Lots of highs and lows and everything in between. I'm ready for August to kick in now, and maybe with it summer will return? here's hoping because I'd sure like to stop dressing for winter in JULY. I've been using lots of lovely beauty products this month too and it was pretty hard to narrow down my favourites. A few things I've only had for a few days & I was considering adding them in already! And then there's last month's faves which I am still obsessed with. I mentioned the John Masters Rose & Apricot Hair Milk the other week and my feelings haven't changed a bit. I still use it in exactly the same way and love the results. My hair isn't left weighed down and even though I've been skipping conditioner my hair is soft and not a tangled mess at all. Love! From hair to body now and the De Mamiel Salvation Body Oil is just b.e.a.utiful. I only have a baby sized bottle and am not sure I could justify spending on the full size, but I love it all the same. It has this gorgeous warm, earthy scent mixed with florals, and you only need a few drops per limb to moisturise, a real treat. Part of me wants to ration it out but I think I'm just going to use it all up without shame as I really need to stop rationing my beauty bits and actually USE them, crazy! 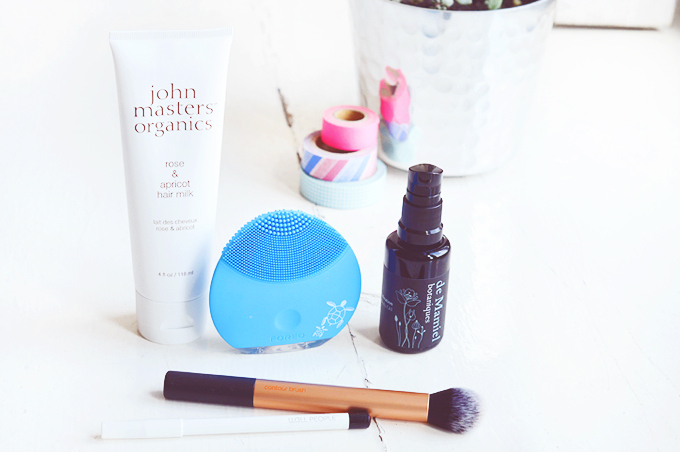 The Foreo Luna Mini is a surprising fave this month, it has totally changed my skin! I have the special edition version where net profits will be donated to ocean conservation, something which is very important, so if you're thinking of making the purchase skip a pretty pink version and get this one! It is gentle enough to be used twice a day as there is no crazy exfoliation happening from a brush head and it leaves skin completely clean and soft, plus it's compact and great for travel AND one single charge has enough power for 5 months of use, amazing. Makeup wise I have two favourites this month, the Real Techniques Contour Brush has been seeing a lot of use this month as I've found it's perfect to apply and blend my favourite mineral concealer from Alima Pure. It's just the right size for under my eyes and using to cover blemishes with a tap and blend kind of motion. And oldie but a goodie for sure. Lastly, I am pretty smitten with my new eyeliner of choice; the W3LL People Hypnotist Eye Pencil in Black. It's just the right texture for applying to my waterline and doesn't irritate or smudge at all. If there's one makeup product I couldn't live without its eyeliner (maybe concealer too) so I have to make sure it's really, really good! P.S. Make sure to sign up to my (super awesome) newsletter as this months edition will be hitting inboxes tomorrow afternoon!